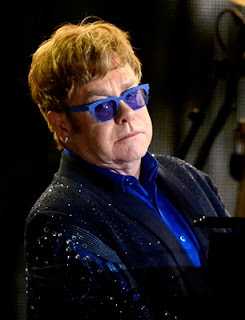 "I'm not the sort of artist who'll get played on the radio," Elton John said yesterday in a studio on the west side of Los Angeles, explaining why he was hosting a small listening party for his next album, The Diving Board. While that might sound absurd coming from a man with a staggering 59 Top Forty hits in the United States, the last entry on that ledger was a LeAnn Rimes duet back in 1999. The Diving Board is unlikely to persuade radio program directors to stick him in heavy rotation, but it's John's best work in years: With the encouragement of producer T-Bone Burnett, John returned to the piano/bass/drums arrangements of his earliest albums, making a stripped-down record that feels like a CinemaScope western. A beaming John said, "It's got everything I love about American music: gospel, soul, country." Sitting in the control room of that studio, wearing an Adidas tracksuit and Nike sneakers without socks, Sir Elton listened intently to his own record, clasping his fingers, tapping his feet, even conducting with his left hand when one of the songs was garnished with cellos. Highlights included "Oceans Away," a melancholy ballad about dead soldiers; "My Quicksand," a cabaret tale of sliding into decadence ("I went to Paris once / I thought I had a plan / I woke up with an accent"), the boogie-woogie "Mexican Vacation (Kids in the Candelight)," and especially the title track, about the vertiginous distance between teenage dreams and adult success, which feels like it could stop the world spinning for five minutes. John's longtime collaborator, Bernie Taupin, wrote the lyrics for thirteen songs, showing his usual facility for both evocative couplets ("You're the diner in my rear view / A cup of coffee getting cold") and overripe verbiage (the song about Oscar Wilde getting out of jail); John also improvised three short instrumentals. "It's the most piano-orientated record I've ever made," John said, sounding mildly astonished. Raphael Saadiq played the bass, Jay Bellerose the drums. Guest musicians included Doyle Bramhall II and Burnett on guitar, and Motown legend Jack Ashford on percussion. "On 'A Town Called Jubilee,' he used the same block he played on 'What's Going On'!" John marveled. "Home Again" was a yearning ballad that seemed to sum up the album: While piano notes fell down like baptismal waters, John sang about wanting to go back home. What made it more than cheap nostalgia is that The Diving Board did feel like a homecoming. "It's the album I should be making after The Union," John said proudly, referring to his 2010 collaboration with Leon Russell, also produced by Burnett. "It's the most adult record I can make at my age. I'm just heading toward being eighty years old and playing at the Holiday Inn."